Ukrainian President Petro Poroshenko has introduced newly appointed chief of the Main Intelligence Department of the Defense Ministry of Ukraine Major-General Vasyl Burba to the department's personnel, the president's press service reported Monday. "I have no doubt that this appointment will give a fresh impetus to the activity of military intelligence in Ukraine," Poroshenko said during the introduction. 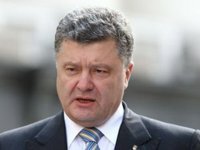 The Ukrainian president noted that military intelligence's performance had significantly improved in the past two years. He also pointed to drastic change in the quality of information provided by intelligence officers, the press service said. Poroshenko also noted an improvement in interaction between the military intelligence directorate and other local security agencies, namely the SBU Security Service of Ukraine. He also said that the data exchange between respective agencies of Ukraine's partner states had become better. What is more, Poroshenko stressed the importance of boosting intelligence activity in support of the effective work of both the Ukrainian military and diplomats. He also spoke about the importance of expanding secret intelligence capabilities and increasing the potential of radio electronic intelligence. Poroshenko separately touched on the priority of social security for families of military intelligence officers. Burba, 38, was appointed to head the Ukrainian military intelligence directorate on October 15, 2016. The major-general graduated from the SBU National Academy, majoring in law. He has worked for the Security Service of Ukraine for a long period. Burba has participated in the Anti-Terrorist Operation in Donbas.